Quentin Pickard has provided this photo of St George's church, the parish church for Old Brentford. The church closed in 1959 and later housed the Musical Museum for nearly 40 years. In 2009 plans were approved to convert the church into accommodation. The smaller building is now known as Sarah Trimmer Hall, which opened in 1786 as a Sunday School and was later known as the Green School. 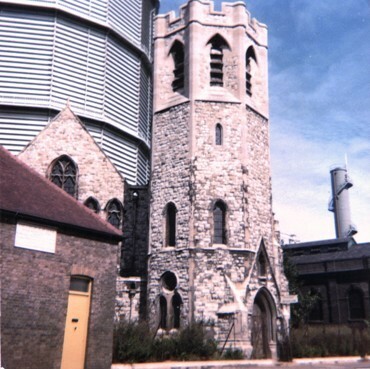 Quentin's photo suggests there was hardly a whisker's breadth between the church and gasometer. Nikolaus Pevsner refers to it as St George (by-the-gasholder) in his Middlesex volume of 'The Buildings of England'. See a 2002 photo or find out more details about this area.